The British Pound continues the decline against the USD that started on Monday. Due to lack of macro-economic statistics, the pair has lost over 100 points, as yesterday’s rapid growth has provided investors with attractive conditions to close long positions and take profit. Today, market participants are waiting for the data on industrial output in the manufacturing industry and volume industrial production in the UK in January. According to forecast, both indices will decline, which will put additional pressure on the Pound. Resistance levels: 1.6627, 1.6706 and 1.6740. Support levels: 1.6623, 1.6590, 1.6570 and 1.6545. On the four-hour chart Bollinger bands are diverging, which confirms downtrend. MACD histogram is below the zero line and its volumes are increasing, giving a signal of further decline in exchange rate. It is likely that the price will continue to drop today. If current trend maintains, it is recommended to place short positions from the current level with the target of 1.6590. 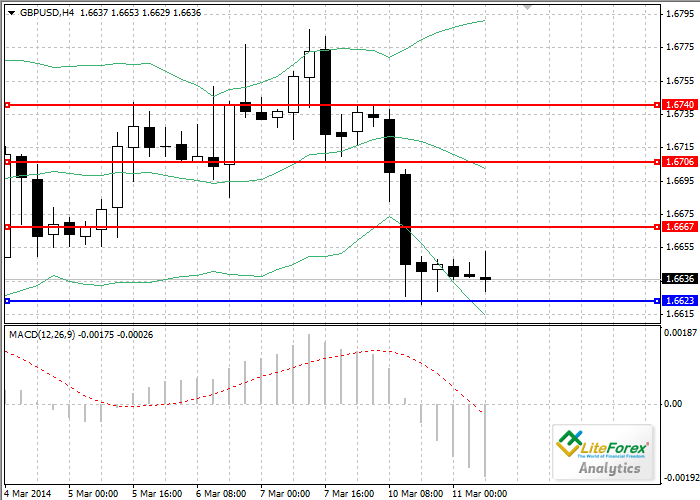 Breakdown of the level of 1.6590 will open the way to 1.6570.